Robots are everywhere, and soon they’ll be capable of just about anything. They don’t all have to look like Fritz Lang-esque automata, though. Some of the most impressive, innovative stuff a robot can do is being done by quadrotors — aerial robots capable of more than you might ever realize. Here are some of the most amazing things quadrotors are up to. Imagine if a fleet of flying robots came down from on high and built the next great cityscape. Granted, that may sound like something dreamed up by the Wachowskis, but it's actually not that far removed from reality. Back in late 2011, Swiss architectural firm Gramazio & Kohler teamed up with Raffaello D’Andrea to launch a project called “Flight Assembled Architecture” at the FRAC Center in Orléans, France. The installation involved a swarm of quadcopters constructing a 20-foot-tall, 11-foot-wide tower composed of 1,500 polystyrene blocks. Aided by an array of motion capture sensors and a precision fleet management system, the miniature robots were able to construct their skyscraper in a matter of weeks and in complete harmony. The architects behind the experiment want the achievement to stand as a model for future forms of construction, and have released a book about their process. To be clear, building a 20-foot-tall tower out of polystyrene is not the same feat as, say, building a gleaming glass and steel structure like Dubai’s 2,722-foot-tall Burj Khalifa. Instead, large-scale projects that make use of quadrotors are employing them for aerial photography and imaging. For instance, researchers at the University of Granada in Spain used them to create 3D renderings of historic buildings. But we can dream. Who needs a jetpack when you have a quadcopter belt? Inspired by the classic James Bond movie Thunderball, industrious DIYer Rodger Cleye crafted an eight-pound quadrotor contraption capable of lifting objects that weigh up to two pounds — things along the lines of soda and pizza. For this particular experiment, he enlisted the help of a 2.2-pound inflatable mannequin named Sean, strapped him in, and sent him flying. When all was said and done, the quadcopter belt could sustain flight for about eight minutes. Pretty impressive. The Centers for Disease Control and Prevention puts the average weight of a human male at 195.5 pounds, so we have a long way to go before a project like Cleye’s project is feasible for everyday transport. But give it a few years; maybe this will be your children’s preferred mode of travel. Quadrotors don’t have to be confined to visions of the future, though. They’re being used in the present day in myriad ways, in research settings and often just for the sake of fun. One project, led by researchers from the University of Maryland and Stanford, involved developing a quadcopter with biomimicry in mind. Inspired by geckos, which have the unique ability to adhere to most surfaces, the team developed a quadrotor armed with a special dry adhesive that can stick to smooth surfaces. While there are certainly plenty of security opportunities to be found in an invention like this, it could be used to spy on your cat. Quadrotors have learned how to play catch. They're better at aerial acrobatics than you are. They can even play the James Bond Theme. The point is, this is a technology that can find its way into people’s homes, their businesses, and pretty soon their everyday lives. There is no shortage of ideas about what quadrotors can do, and the work is only just getting started. Pretty soon, there won’t be any limits to what they’re capable of. It’ll just be a matter of making the choice about how the tech gets developed. That’s why the Air Force is so fascinated by them, and are spearheading an effort to get people to work with them as both a point of research and a means of having fun. The effort is called The Air Force Collaboratory, and it's the first online collaborative platform that brings Airmen and everyday citizens together to solve real-world problems. That means finding innovative ways for quadrotors to head up search-and-rescue missions after disasters like the Haitian earthquake, or navigate compromised nuclear facilities like in tsunami-racked Fukushima. If you believe the future lies in this kind of technology, The Air Force Collaboratory is where you want to be. Want to learn more? 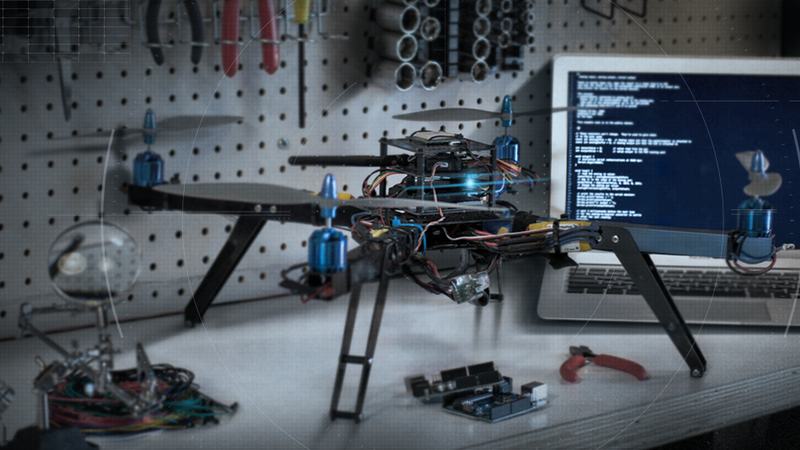 Click here to check out how these aerial robots are the stuff of the future you’ll build.